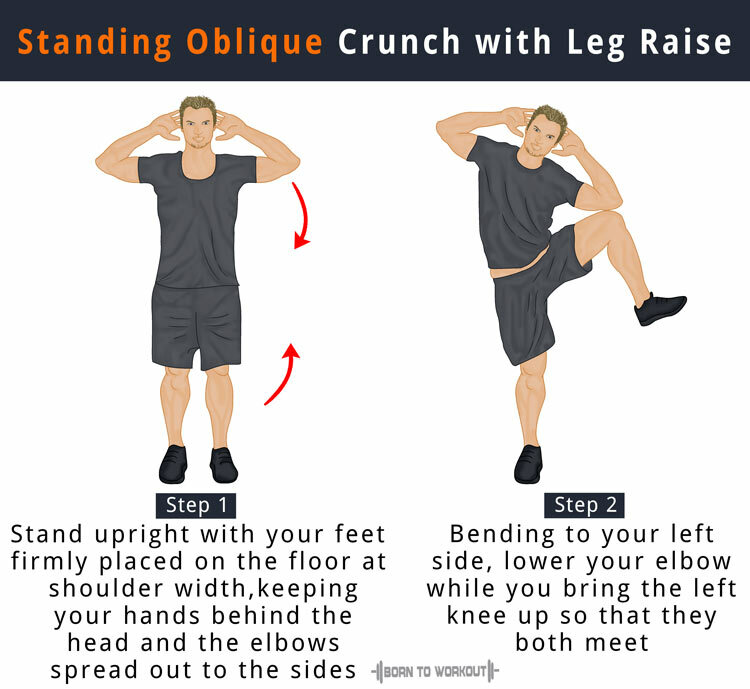 These crunch exercises improve your core strength, balance, and help you build a ripped set of abs. Being less straining on your lower back and neck than other ab workouts, these suit those who have had previous neck and back issues. However, it is advisable that you consult an experienced fitness trainer before doing these exercises. You may integrate standing side crunches into your high-intensity interval training (HIIT) routine. Set up a pulley cable machine with a grip attachment and the weight of your choice. If you are doing this for the first time, start with a lighter weight. Grab the handle using your left hand so that it faces your body. Make sure your forearm is positioned at an angle of 90-degrees to the upper arm and your feet firmly placed on the floor at shoulder width. It is the starting position. Keeping your head up and back straight, pull the weight down using your left oblique muscle as far as you can. Pause for a second and then return to the initial position. Perform the desired amount of reps before switching to the other side. Stand upright with your feet firmly placed on the floor at shoulder width with the toes pointing forward. Keep your hands behind the head with the fingers interlocked and the elbows spread out to the sides. It is your initial position. Place your body weight on the right leg and lift your left leg out to the side keeping your knee bent. Bending to your left side, lower your elbow while you bring the left knee up so that they both meet. Return to the initial position by straightening your back up and keeping the free foot on the floor. 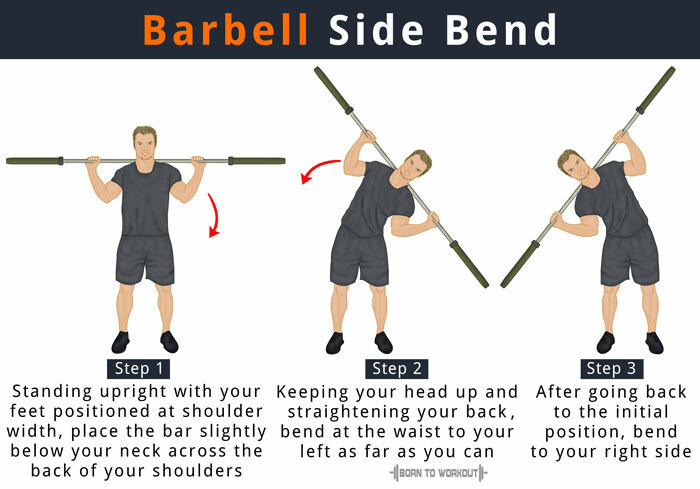 Do the desired number of reps on your left side before switching to the right. 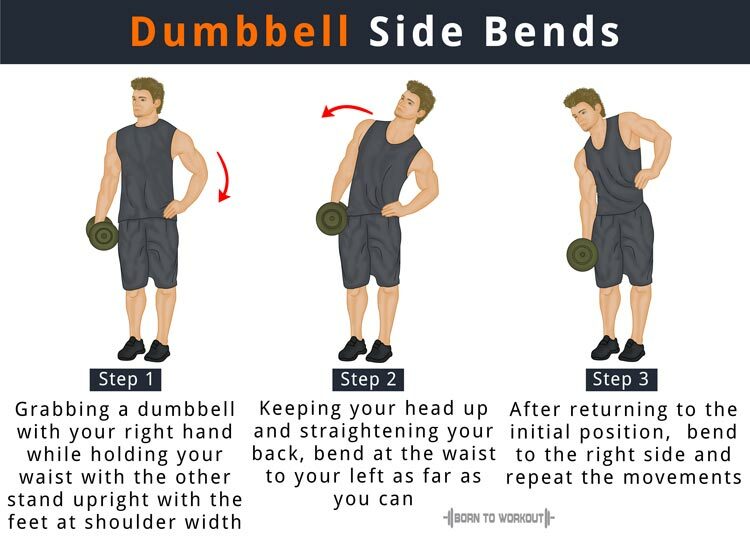 Grabbing a dumbbell with your right hand using a supinated grip and having the left hand to hold your waist, stand upright and position your feet at shoulder width. This is your original position. Keeping your head up and straightening your back, bend at the waist to your left as far as you can. Pause for a second and then return to the initial position. Now bend to the right side and repeat the movements. Perform the recommended number of reps and then repeat the movements by holding the weight on your left hand. Standing upright with your feet positioned at shoulder width, place the bar slightly below your neck across the back of your shoulders. It is your starting position. Keeping your head up and straightening your back, bend at the waist to your left as far as you can. Go back to your starting position after holding for a second or two. Repeat the movements after bending to your right side. Perform the desired amount of reps, as recommended by your fitness trainer. 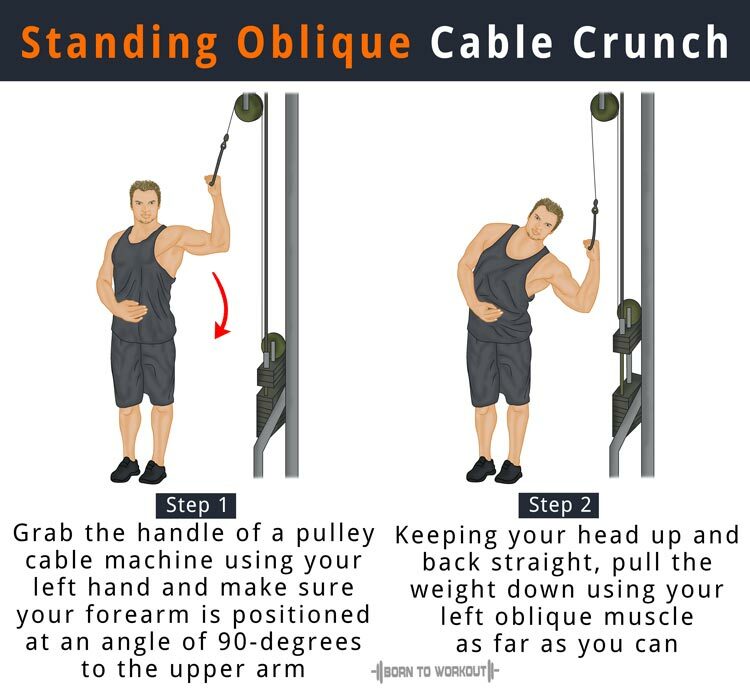 Keep the arm you are using to grab the cable machine stationary at all times. Perform the movements slowly to engage your oblique muscles.